This lovely Passage to San Marco tapestry shows a waterway with bridge and a gondola nearby. The island of San Marco, in Venice is a place filled with the most iconic sights of Venice, such as St Mark's Basilica and Square, and here we see gorgeous cafes and villas on a sunny day, with flowers and wisteria in bloom, and a gondola parked nearby. The play of light and shade in this work is beautiful as is its use of color. 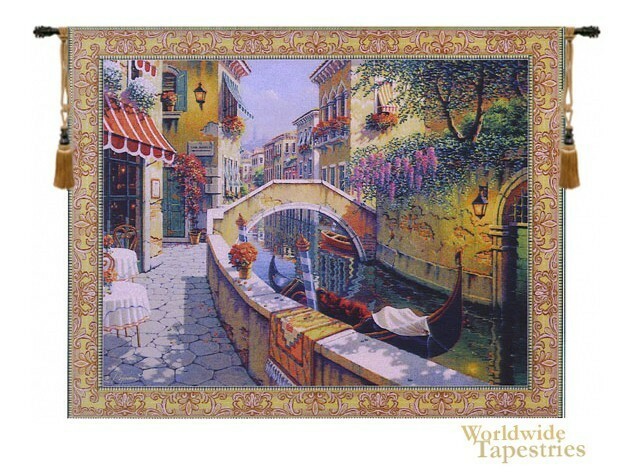 Full of charm, this "Passage to San Marco" tapestry is backed with a lining and has a tunnel for easy hanging. Note: tapestry rod and tassels, where pictured, are purchased separately. Dimensions: W 64" x H 52"